DJ Eye Tech on The Voice (BBC) - Will.i.am called him a "Superman DJ"
Express and Echo article Paralysed DJ relishing life on the airwaves with hit show about Bram Harrison and his ongoing success as a Radio Presenter. Article about Locked in Syndrome and DJ Eye Tech in The Times. Front page of the Express and Echo newspaper about the first Eye Life Show. At the age of 20, Bram had a devastating cycling accident, which left him paralysed and unable speak, yet his mind remained intact and active. The only muscles unaffected were his eyes. This rare condition is aptly called Locked-in Syndrome and has been described as "the closest thing to being buried alive". Despite his severe disabilities, Bram was determined to be heard. With the support of his family, he learnt to communicate using his eyes and an alphabet board, laboriously spelling out words, letter by letter. But, much of what he wanted to say, remained unspoken. "It is a very lonely place stuck inside your own head" said Bram, "You cannot start a conversation, or comment on something without first getting somebody's attention to use the board with me, then you have to wait whilst they work out what I am trying to say." Bram's indomitable spirit, combined with his love of music inspired him to pursue his ambition to produce his own music recordings. With the assistance of music collaborator, Philip Robinson, he wrote the lyrics and produced the rap 'Locked In'. 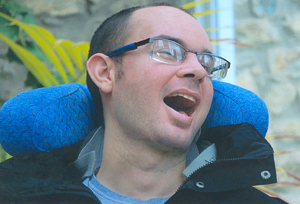 Philip Robinson said, "When I first met Bram, he was a young man unable to communicate with the world around him: his thoughts and feelings, questions and ideas, laughs and cries all literally locked-in; to us he was just silent. Through determination, patience and above all an amazing capacity for organising and remembering complex thoughts, he began to communicate his world to those around him. On the way he has produced and devised astonishing music, created and written lyrics for rappers about his experiences of his condition, all done with a very black sense of humour and an inspirational realism of what it is to be alive in a moving/talking world, when you can do neither." A breakthrough in computer technology has now given Bram a communication tool that will allow him to be heard, once more. 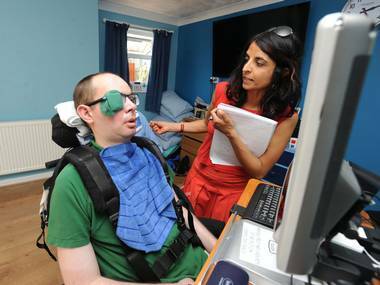 Using an eye controlled computer, he can produce sentences which the computer 'voice' then reads out. Mastering the eye-tracking software has opened up new opportunities for Bram. Adopting the name DJ Eye Tech, he now presents his own two hour show on Phonic FM, and on the internet. Tony Walker at Phonic FM said, "His voice has been silent for all of the time he has had to live with Locked-in Syndrome, but now the whole world can hear him." The first radio show was broadcast in July 2009. Now, thanks to that success, Tony Walker and Philip Robinson, are working with Bram to produce a regular Saturday show. Each broadcast is pre-recorded, allowing the producers to edit together Bram's computer generated voiceover with the music tracks, which Bram has personally selected, then spice the whole show up with some lively jingles. "I no longer think of him as that bloke that can't move. Now I'm proud to say he's been my creative friend and collaborator, who's a pretty cool dude, got a wicked sense of humour and helps me put my small problems in perspective." said Philip Robinson. Bram is truly an inspiration. He has overcome monumental problems to achieve his ambition. Now this remarkable young man will never be silent again. "People talk about large sums of money being life changing, but in my case, it's been the big improvement in technology. Now the whole world can hear my voice", DJ Eye Tech.